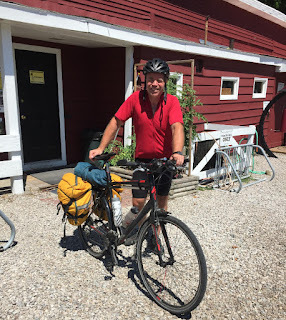 Mark stopped into the Century Cycles store in Peninsula today. He is on the final day of a bicycle touring trip that started just south of Columbus, riding the Ohio to Erie Trail back to his home near Mantua, Ohio. He needed to have us true his front wheel and replace a broken spoke on his rear wheel. Thanks for stopping by, Mark, and safe travels!